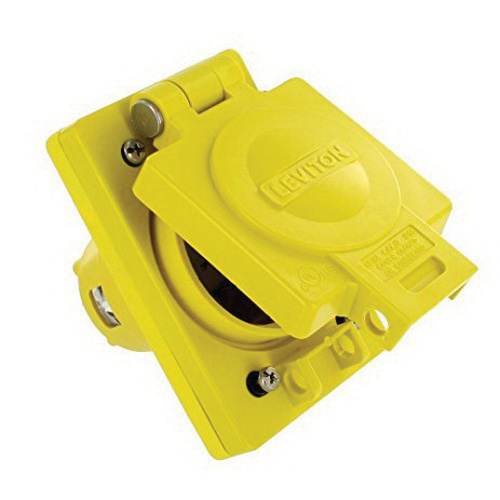 Leviton Wetguard® Industrial grade locking single outlet in yellow color, accommodates conductors of size 12 - 8-AWG. It has a dimension of 4.63-Inch x 3.13-Inch x 3.64-Inch. This 3-Pole, 4-Wire, 3-Phase outlet has valox PBT, nylon construction for long life. It has current rating of 30-Amps and voltage rating of 480-Volts. It withstand dielectric strength of 2000-Volts and temperature range from -40 to 60 deg C. Outlet with non-magnetic stainless steel assembly screws, has electroless nickel-coated brass contact for superior conductivity. It has electroless nickel-coated brass terminal screws for terminal connection. EPTR rubber part offers resistance against extreme temperature variations, wet and damp environments. Multi-point sealing system uses nut, strain relief washer and rubber bushing to comprise a watertight cord grip seal. This outlet has stainless steel torsion spring mechanism for flip lids and comes with santoprene TPV cover gasket. It has IP66 rated degree of protection. It is UL94-V2 flammability rated to withstand hazardous environmental conditions. 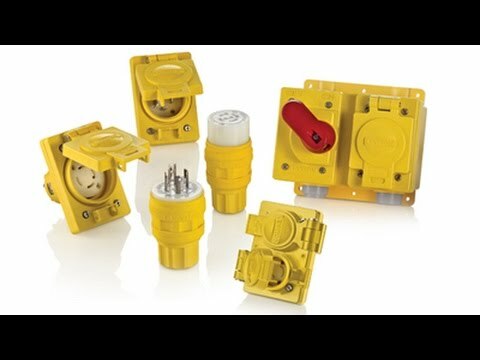 Outlet is UL listed, CSA/NOM certified, NEMA rated and meets ANSI standards. * Inventory displayed is accurate as of 04/21/2019 07:40 EDT.